On this Web page, we announce new software tools as they're added to our site, new solar monitoring stations or station upgrades, workshops or training we present, and other developments that might be of interest. 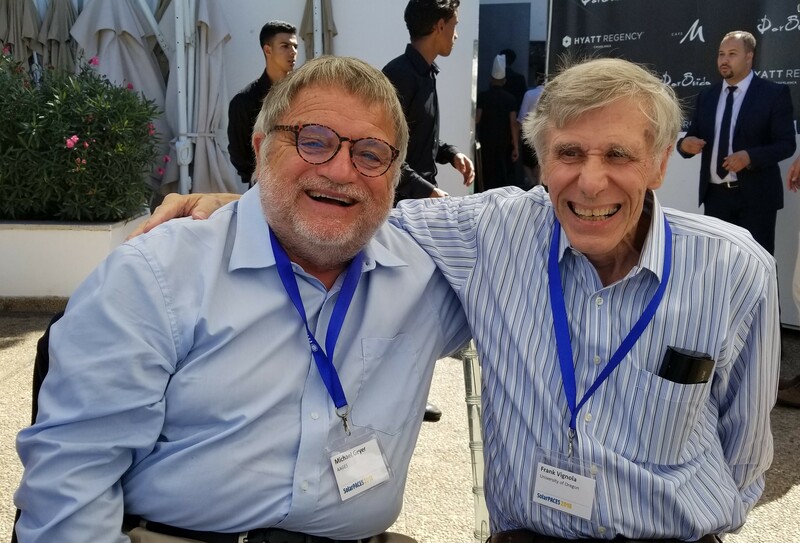 At SolarPACES 2018, Frank Vignola met with Mike Geyer who was an international student who worked at the lab when Frank Vignola was just starting at the lab in the 1977-1978 time period. Mike went on to play a leading role in development of concentrating solar systems, overseeing the construction of half a dozen large solar facilities around the world. The National Renewable Energy Laboratory (NREL) and the UO SRML are involved in a joint project to evaluate the performance of reference solar cells and photodiode-based pyranometers on tracking surface. 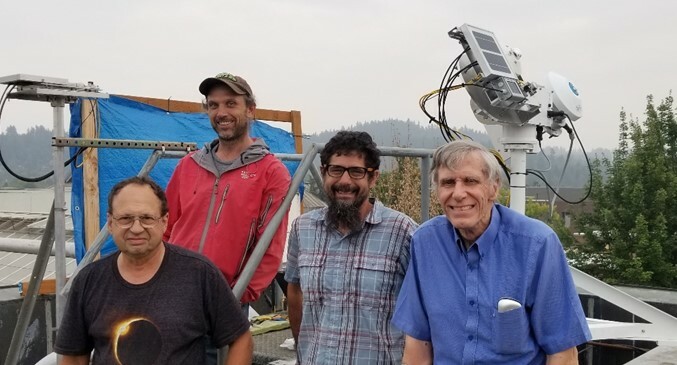 Picture of Mike Dooraghi, Rich Kessler, Josh Peterson, and Frank Vignola in front on a one-axis tracker with pyranometers, reference cells, and a spectroradiometer just installed in Eugene. Mike Dooraghi from NREL lead the installation with help from the UO crew. We have added a Web-based sundial plotting tool to the plotting tools already available on our Web site. The program plots the tip of a shadow cast by a pole (or 'gnomon') as the earth spins under the sun. The plot can be used to determine when a shadow from an object will interfere with a PV system's performance. If the PV system is drawn on the plot and a line is drawn from the base of the pole [located at (0, 0)] to the tip of the shadow, one can see when the shadow from the object would block the PV system panel. Ideally, the system should be located where there would be minimal shading. The sundial plotting application can be found here. Optional settings allow a variety of scales to be used along with an assortment of line colors and styles as desired. Charts can be created in either PDF format or PNG format for more versatile graphical use. If an extended object like a roofline or a row of PV panels is visible in front, then a series of "poles" can be superimposed next to one other to show how the shadow would be cast. Note that the area boarded by, say, February 21 and March 20 between 7:00 and 8:00 am receives the same percentage of sunshine as the corresponding time period depicted on a shade analysis form, such as these. Therefore if the solar contribution on the shade analysis form is 1% of the annually PV system output, the same percentage production would occur during the corresponding time period on the sundial plot. Soon we will have more details about this new station. Right now you can down load data just as you do from our other stations. You can now download shade forms we created for the Eugene Water and Electric Board or those we made for the Emerald People's Utility District. We explain all about these kinds of forms and how they're used here. The UO SRML now hosts a Web site where Oregon wine growers can learn about, and download, software to help them save energy and water resources. We now have a series of high-quality maps showing average annual and monthly global, direct normal, and diffuse irradiance throughout our region. You can see all the "thumbnail" graphic links to full size maps, such as the one below, on this page. Our map showing the locations of all our monitoring stations has been improved and we've added the newest stations to it (see below). You can see our new map here. Solar data, along with photo-voltaic production data from eight monitoring stations that have come on-line within the last year, can now be downloaded from our Website. The new stations (some of which now augment previously existing stations located nearby) are in or near Cannon Beach, Portland, Salem, Eugene, Bend, Grants Pass, Klamath Falls and Richland. You can see where these stations are located on our monitoring station map, and you can download data from these stations through links on our main data page. Solar radiation data from our subsidiary station in Silver Lake, Oregon, is now available on our Web site. This station came on-line December 13, 2002. On October 12, 2002 the UO Solar Radiation Monitoring Laboratory installed a new reference-level solar monitoring station in Dillon, Montana on the campus of the University of Montana - Western. 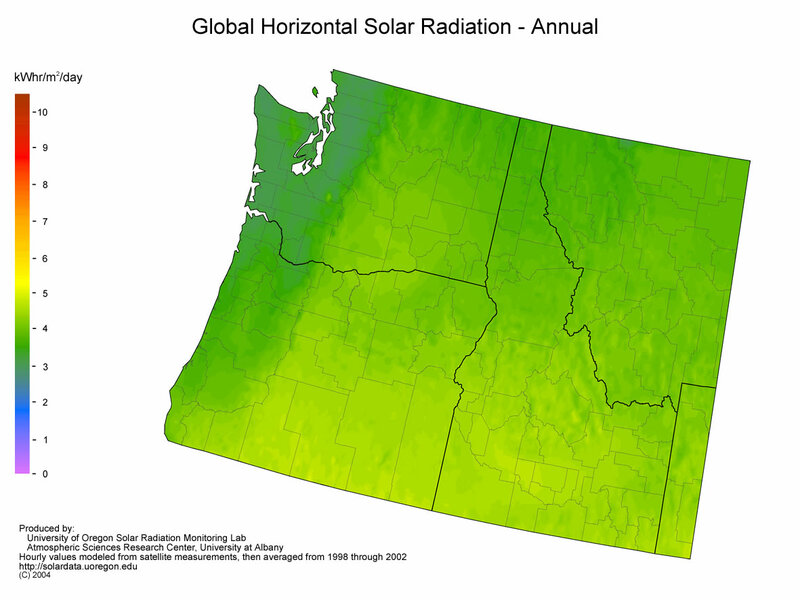 The station provides high quality solar radiation data for south western Montana and extend the line of high quality stations from Eugene, Oregon through Idaho and into Montana. Students at Willamette High School in Eugene are gathering real-time data from a new solar monitoring station located prominently on the roof of their Administrative Office building. This project is the result of a joint effort by Willamette High, Eugene Water and Electric Board, and the UO SRML. Data from the station is now available on this Website. We're pleased to announce that you may now generate online charts of our archival (short interval) data. In addition to the general purpose program interface provided by the previous link, we've added special links, allowing you to display charts of the very latest data, from all of our Web pages that describe currently active SRML stations. We hope you find this facility as useful as we do.  Plot the path of the sun as it crosses the sky.  Create your own sun chart online.  Use the sun chart to evaluate your solar potential.  Determine which trees or buildings will block your access to direct sunlight. Last revised: Oct. 19, 2018.